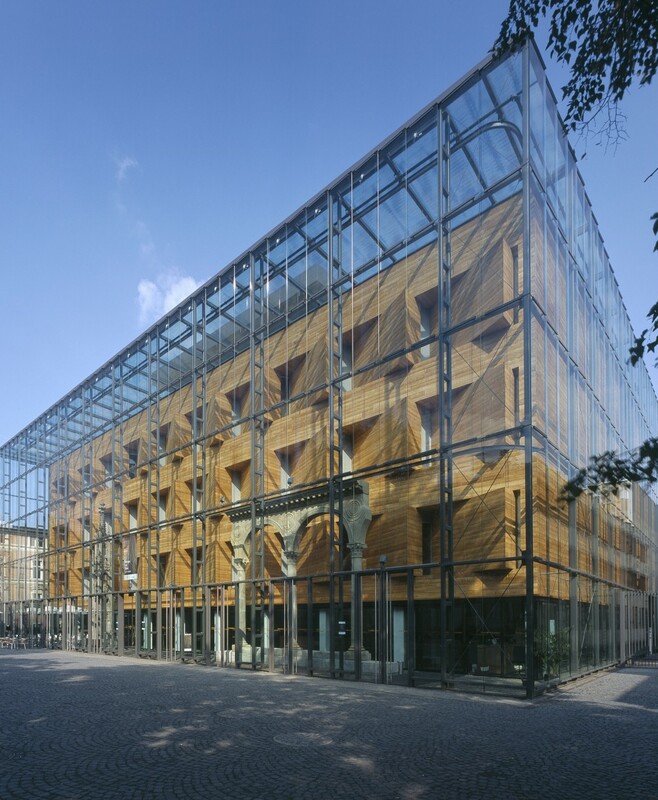 Cross Culture Timeline (CEMEC, NoHo Dublin) in der Ausstellung Europa in Bewegung im LVR-LandesMuseum Bonn. Foto: J. Vogel, LVR-LandesMuseum Bonn. 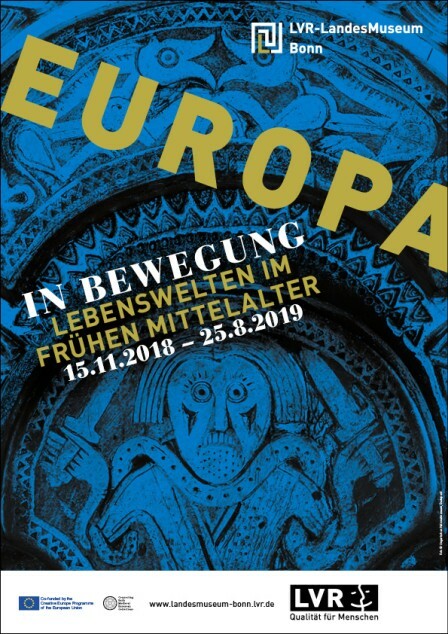 Ausstellungsraum zum Thema Verbindungen in der Ausstellung Europa in Bewegung im LVR-LandesMuseum Bonn. Foto: J. Vogel, LVR-LandesMuseum Bonn. Ausstellungsvitrine zum Thema Handeln mit Luxusgütern zum Thema Verbindungen. Foto: J. Vogel, LVR-LandesMuseum Bonn. The Western Roman Empire ended in 476 CE with the onslaught of the Great Migration of the Peoples. To our way of thinking, this date marks the beginning of the "Dark Ages", with the decline of the culture of Antiquity in economics, trade and education. In all of Europe, the Middle East and North Africa, the Roman Empire that had united them was followed by the politically splintered Early Middle Ages with the Germanic successor empires of the Franks, Visigoths, and many others. In the eastern part of the Mediterranean world, however, the cultural heritage of Antiquity lived on yet for centuries in the Byzantine Empire. 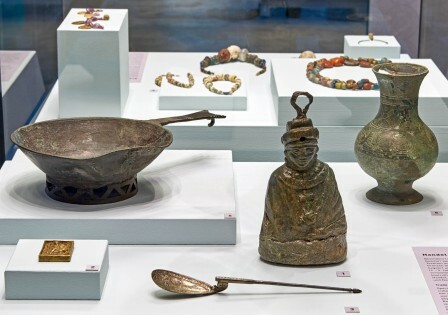 This exhibition presents a surprisingly complex and multifaceted picture of the Late Antique and Early Medieval period in the regions between Ireland and Spain in the west and Egypt and Hungary in the east. For all the differences in the way they dealt with their antique heritage, this epoch has been characterized by fascinating connections between the various life worlds with their downright exuberant cultural diversities. Ca. 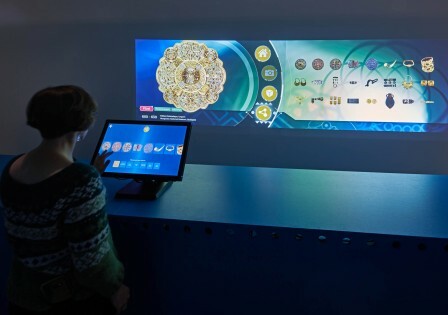 150 precious objects from the most important European museums give eloquent testimony to the active exchange of ideas, beliefs, traditions, and traded goods. In the exhibition you will encounter remarkable people, who traversed, explored, and mediated between the distant worlds for us in their lives as pilgrims, scientists, tradesmen, and travelers. 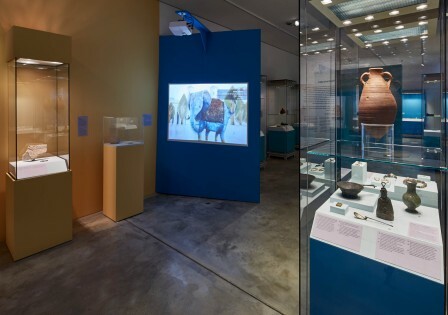 This exhibition is the result of an international cooperation under the auspices of the CEMEC Project (Connecting Early Medieval European Collections) sponsored by the European Union. Museums in Amsterdam, Athens, Bonn, Brussels, Budapest, Dublin, Jaén, and Rome as well as numerous scientific and technical partners from Germany, Italy, the Netherlands and Ireland have made it possible to join together to present outstanding objects in connection with innovative media and mediation techniques. In this way, exciting and often new notions come about of a world unjustly regarded as being so far away. With its ideas, religions and cultures, it continues to influence Europe and the Mediterranean region even today.